Upon opening the app you are greeted with Hippo. You enter the players name (you have up to 4) and you are ready to begin. Located on the bottom of the opening page you will find a link to other Splash Math apps in the iTunes Store, a Parents section and ‘more’ (rate it, gift it, feedback, share it). Included is the child’s overall progress in the areas. Goals & Syllabus as also be set here also. Very comprehensive information on getting the most from this app in easy to follow instructions. What I noticed first was the bright coloured images, made of clay, so carefully put together – beautiful engaging graphics and clear simple instructions. Going through the activities, I found it very easy to use. The similar questions asked in many different ways to check understanding – just brilliant. The use of counters, blocks, equations, sorting colours, sizes, greater than, less than, so many wonderful questions, you can see that a lot of time and thought has gone into the preparation of educational content. After you have completed a number of activities you are rewarded with a ‘feature’ for your own Jungle, you get to either pick a type of tree or an animal. The animals (oh and their names are just gorgeous) do a variety of activities – they are just so much fun – a real highlight. Even though this is a great Math app for Kindergarten children, preschoolers would benefit from it too! This app will remain on my iPad for a very long time. Prequel to the successful Splash Math Series Grades 1 to 5 – Splash Math Kindergarten app allows kids to get started with Math practice in fun way. 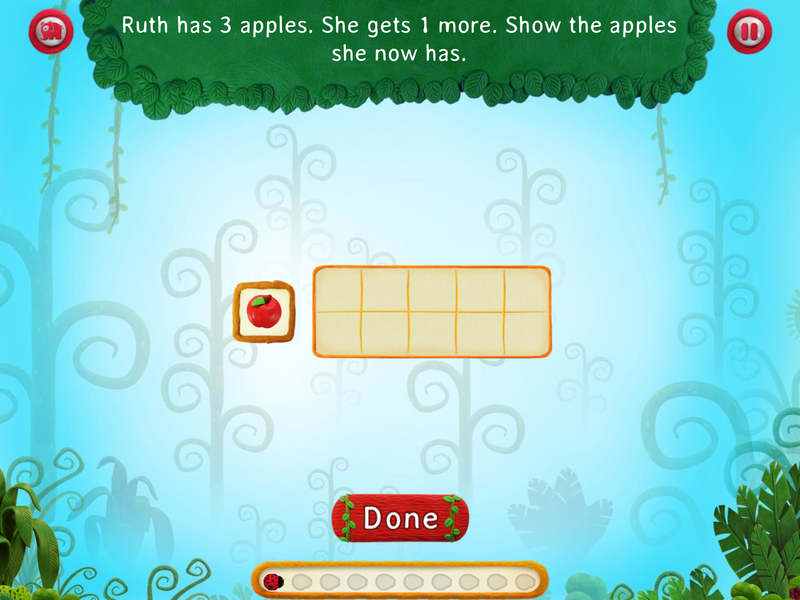 Ideal for kids 3-6 years in age, it’s a superb math game for kids in preschool and kindergarten. 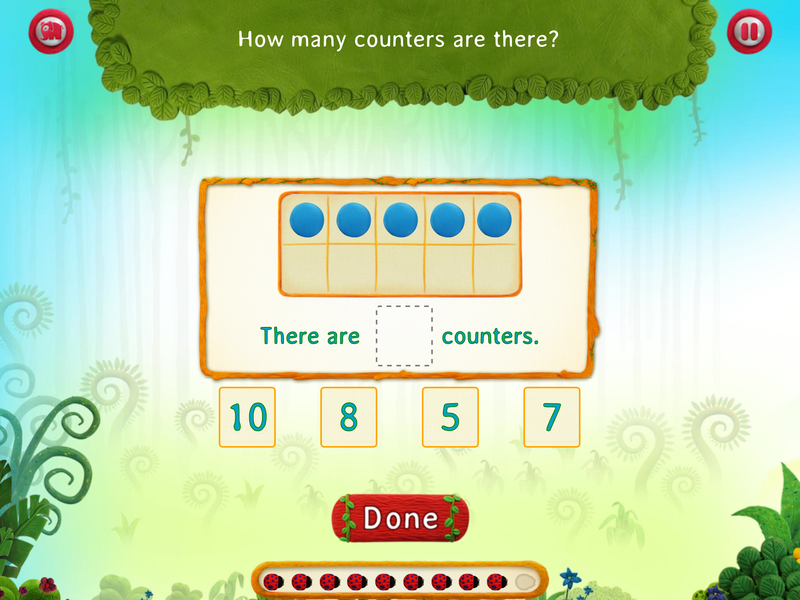 The app offers a unique way for kids to master basic kinder math skills in the format of a fun math game. 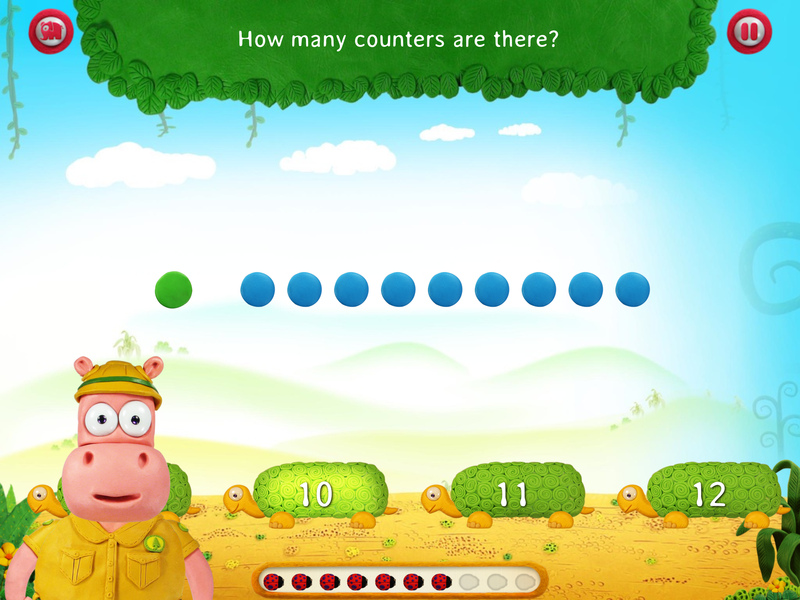 Your kid will love practicing counting numbers, kindergarten addition, subtraction and other math concepts with cute animal friends in the app. 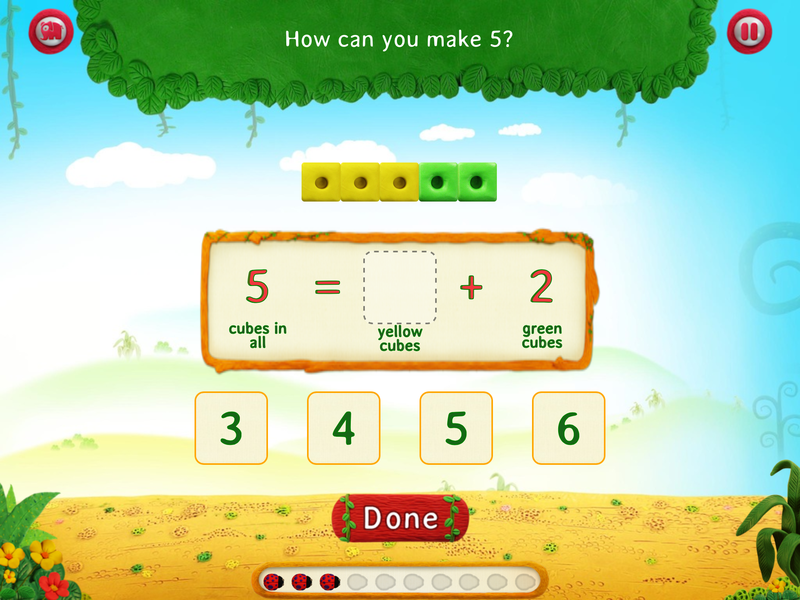 Your kid will learn to count, compare, add, subtract, classify numbers and identify shapes. The eight interactive lessons in the app will give your kid ample practice of basic arithmetic operations like counting, addition, subtraction and simple geometrical operations such as identification of shapes, 2D/3D figures, etc. Fun with Numbers and Animals! Your kid will be relaxed and enjoy the math learning experience. Splash Math Kindergarten app rewards with cute animal characters as incentives on achieving the math goals set by you. 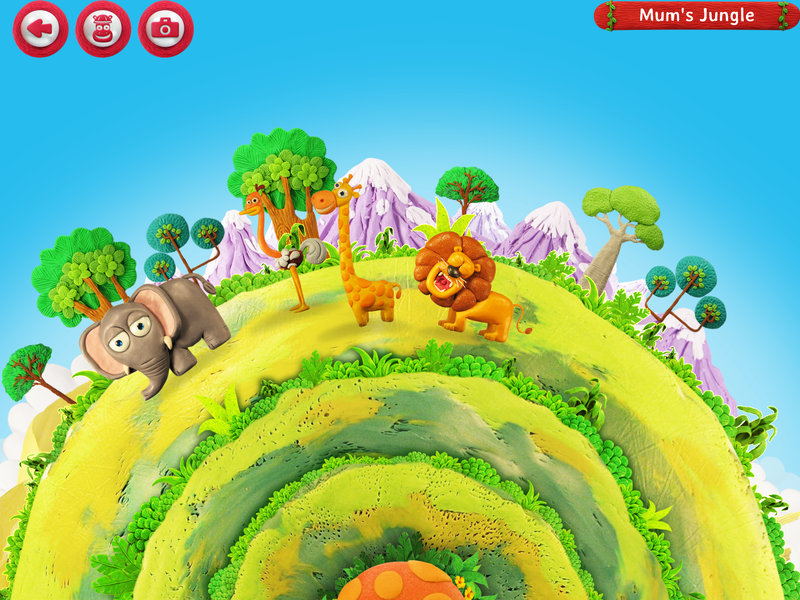 With these amazing animals, he can form his own jungle, where all the characters would dance, roar, jump or walk to his taps on iPad. • Goals and Reminder – Set goals like 10 questions-a-day, 2 prizes-a-day, 10 minutes-a-day and more importantly schedule reminders for the same so that your kids don’t miss regular practice. • Weekly Email reports – Spot your kid’s strong and weak spots. Parents love this feature.